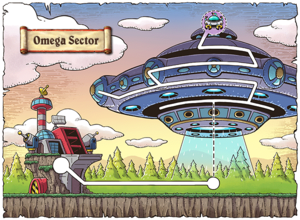 Omega Sector is a futuristic military base that can be accessed via the bottom floor of Eos Tower in Ludibrium (and also using a Return-to-nearest-town scroll at floors 66 and below). Omega Sector is located on a small island in Ludus Lake, alongside its twin island Korean Folk Town, both of which are used to keep Ludibrium afloat via two towers. Soldiers roam the city, and guards are posted at every exit to prevent intruders from entering. It is mainly a forest-type area, serving as the main attack point for the aliens that have invaded. There is a "Silo" area in the center of the town, which acts as the main supply-area for Omega Sector. Inside the Silo are the potion, weapon, armor, and storage NPCs. The Silo has three entry points at various floors as it is quite large. Dr. Kim will call upon players Level 165 and higher to assist in becoming the newest M-Forcer, and stop Dr. Zindelblarp's evil scheme! Note: the M-Forcers were previously called Mesorangers, a reference to Power Rangers, but this was changed to M-Forcers (possibly due to trademark issues). Mateons and Plateons in Omega Sector's Boswell Field. Boswell Field, its name a pun on "Roswell (New Mexico)", an area known for alien stories, is home to the Mateon and Plateon purple aliens. These aliens are similar to the strange Octopi found in Kerning City. At the end of this area is an Intergalactic Transmitter, which, when clicked, calls upon a giant UFO to lift you into it. The inside of the UFO. After using the Intergalactic Transmitter, you will be transported to the bottom of the UFO, where you are surrounded by Barnard Grays to the left and Ultra Grays to the right. There is also a Gray NPC here named Nolyfe, a devoted fan of the M-Forcers, especially Jenny, the Pink M-Forcer, who helps you and the other M-Forcers make it through the UFO to reach Dr. Zindelblarp. The corridors above contain grays riding small saucers, which can attack you. There is also a Star Force zone to the left of this area, which requires 140 Star Force to deal full damage. Above these corridors are air vents, which contain Mecateons and MT-09s, which are purple aliens using advanced mech-suits. At the end of this area is a parachute that takes players to the Control Room, where White and Black Robosaucers (UFO-shaped drones) guard Dr. Zindelblarp. Once you reach the Pilothouse, you can fight his newest invention, the cleaning robot OMNI-CLN! Omega Sector: Omega Sector Quest NPC. Omega Sector: Silo Sells potions and consumables. Omega Sector: Silo Storage NPC. Omega Sector: Silo Sells armor for all jobs. Omega Sector: Silo Sells weapons for all jobs. Omega Sector: Silo Quest NPC. Omega Sector: Command Center Quest NPC. This page was last edited on 31 December 2018, at 04:53. This page has been accessed 92,913 times.